Training will commence at the Finishing Trades Institute of BC training facility in Surrey, British Columbia, Canada. Projects located throughout the province of British Columbia, Vancouver and surrounding areas within the lower mainland. The International Union of Painters and Allied Trades, District Council 38, is seeking Hazardous Materials (Hazmat) Workers. Hazmat workers identify, remove and dispose of ASBESTOS WASTE, ARSENIC, LEAD, MOLD, SILICA, PCB and other hazardous materials. Hazmat Workers clean up materials that are harmful to people and the environment. They usually work in teams and follow strict instructions and guidelines. The specific duties of Hazmat Workers depend on the substances and the cleanup location. For example, removing Lead and Asbestos is different from cleaning up Mold contamination. Asbestos and Lead Abatement: Remove Asbestos and Lead, respectively, from buildings and structures, particularly those that are being renovated or demolished. Most of this work is in older buildings that were originally built with Asbestos insulation and Lead-based paints—both of which are now banned. Until the 1970s, Asbestos was often used in buildings for fireproofing and insulation. However, Asbestos particles can cause deadly lung diseases. Similarly, until the 1970s, Lead was commonly used in paint, pipes, and plumbing fixtures. Inhaling Lead dust or ingesting chips of Lead-based paint may cause serious health problems, especially in children. 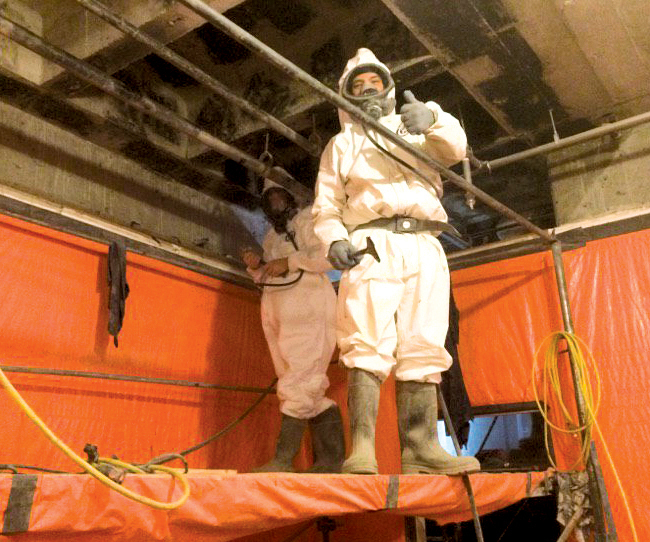 Asbestos Abatement: Hazmat Workers follow procedures prescribed by Regulation to control fibers release from asbestos containing materials in a building by encapsulation, encasement, or removal. Lead Abatement: Renovating or tearing down any structure that has lead-based paints or coatings. Workers apply chemicals to walls in order to remove Lead-based paint. Once applied, workers strip the walls, package the residue and paint chips, and place them in approved bags or containers for proper disposal. Some workers operate sandblasters, high-pressure water sprayers, and other tools to remove paint. Mold Remediation: Although mold is not usually defined as a hazardous material, some mold—especially the types that cause allergic reactions such as Cladosporium and Stachybotrys—can affect a building to the extent that the mold must be removed. Hazmat Workers typically use wet vacuums to remove water, dehumidifiers to reduce humidity levels, and fans to dry the affected areas. They sometimes must use chemicals to neutralize the mold or remove entire sections of drywall, insulation, or carpet. Hazmat Workers wear protective clothing to reduce exposure to toxic materials. Working conditions vary with the hazardous material being removed. For example, workers removing Lead or Asbestos often work in confined spaces or at great heights and bend or stoop to remove the material. Hazmat Workers typically work in office buildings, schools, or historic buildings that are being renovated. Completing projects often requires night and weekend work to meet deadlines. Overtime is common, particularly for emergency flood response. Hazardous Materials Worker receives comprehensive training on the job. Training generally includes a combination of classroom instruction and field work. In the classroom, they learn safety procedures, regulatory requirements, worker hygiene and the proper use of personal protective equipment. While on site, they learn about equipment and chemicals, and are supervised by an experienced worker. Training will commence at our training facility in Surrey, BC, which is known as the Finishing Trades Institute of BC. There is an apprenticeship structured wage program based on hours worked. For more information or to apply, please call Adrian. Call Adrian at 1-778-772-4821 or email at Ahorsburgh@dc38.ca. Anyone who does not reside in Canada must have an up-to-date work permit or study permit and be able to work a 40-hour work week.